To market to market | Eats 2 Tweet! 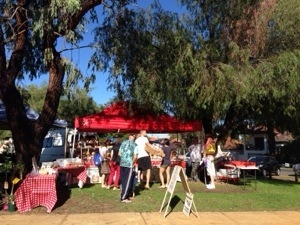 I love that farmers’ markets have popped up all over Perth the past few years as visiting fresh and artisan markets in the country and other cities has been a favourite past time. 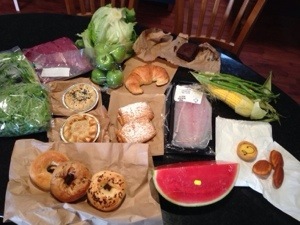 Today I made an early trip to Kyilla Farmers’ Market and it was the busiest I had seen it with parking at a premium. You can get pretty much all you need for a weekend or week of eating fresh and local; fruit, veg, bread, cheese, pasta, small goods, meat, poultry and seafood. Plus the obligatory coffee and bacon and egg roll stands ubiquitous to markets. Looking forward to Cherry Bombe pies for lunch, some sweet treats from Emmanuel Mollois with coffee and either pink snapper or BBQ butterflied leg of lam with salad for dinner. Oh and you must check out Holy Bagels – haven’t tasted them yet bit based on feel and weight alone these look like the real deal unlike so many of the local bagels that feel like a horseshoe roll.